Two little girly females and one Studly male pup ready to go home now. Born 4/19/2013. Mom and Dad on site. These little ones are out growing their nursery and need to go to their forever loving home. They have been Vet checked, tail docked, dew claws removed, two sets of Parvo shots, wormed three times. They come with a Micro-Chip, care package, instructions on How to Potty Train in 5 days, first Schnauzer hair-cut and a Legacy of Love. We offer a payment plan: $500 down and five $100 monthly payments. = $1,000. I will mentor you with your puppy. I guarantee my babies 100% for one year. These pups all have a sweet, wonderful personality. They are super smart and Oh, so pretty. Call me at 530-589-4450 for an appointment or email me: kingreques@aol.com for directions to my Ranch. Waiting for my forever home. This entry was posted in Doggy Tips, Rare White Mini-Schnauzers, Sailor Daddy and tagged Animals, Love 4 Sale, Love For Sale. Bookmark the permalink. 2 Responses to Only three AKC reg. 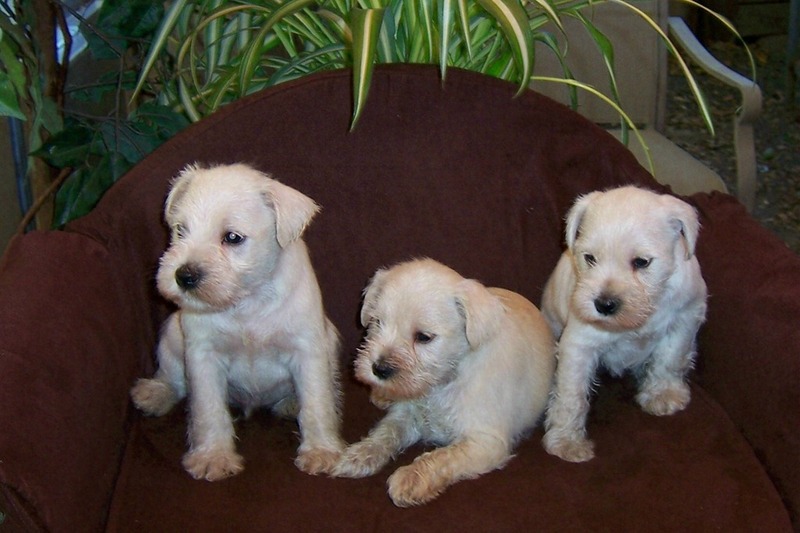 Rare White Mini-Schnauzer pups available from litter of six. I sent you an email with all the information and my phone number. You need to call me for an appointment.